Cartier traditions never hold back the brand. On the contrary, they are what propel them into the future. One such tradition is the Cartier Tank Anglaise watch. An inimitable original, reimagined for the watch lover of today. The Cartier Tank Anglaise watch is genuinely unique. Unlike other watches on the market, this timepiece is the beloved protagonist in a story dating back just shy of 100 years. 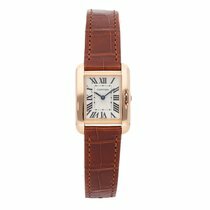 The original Cartier Tank watch was created by Louis Cartier in 1917. Inspired by the Renault FT tanks, the Cartier Tank Anglaise watch is robust, sleek, and formidably stylish. Like the mechanical innovations locked in conflict, the first Tank watch is an angular example of master craftsmanship. At once a square and a rectangle, it effortlessly incorporates the strap into vertical sidebars known as “brancards.” Only six editions of this remarkable analog dress watch have been produced. And such was the esteem surrounding the Tank that Cartier presented the prototype to General John Pershing of the American Expeditionary Force. Since then, the Tank has become one of the most coveted watches of all time. It has adorned the wrists of iconic figures such as Yves Saint Laurent, Jackie Kennedy and Princess Diana, among others. And now it’s time for the latest incarnation to enter the fray: the Cartier Tank Anglaise watch. True to the original Cartier Tank watch, the Anglaise pays homage to the distinctive angular design of the case and watch face. Some models continue another tradition, and carry an elegant, metal strap of seamlessly linked plates. This subtly echoes the continuous tracks of those seen on Renault FT tanks, which also inspired the straps of earlier Tank wristwatches. Other versions of the Tank Anglaise watch integrate a sophisticated strap crafted from brown or black alligator skin leather. A few small, select but powerful design twists set the Cartier Anglaise watch apart from its Tank predecessors. The Tank Anglaise watch breathes new life into the flawless alignment of the original courtesy of a winding mechanism melded cleanly into the case. 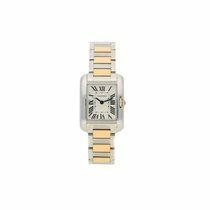 Showcasing a reduced form and pronounced lines, the sleek execution of the Cartier Tank Anglaise wristwatch reimagines the original and stunningly yields an extra dimension filled with charm and style. A true tour de force: The Tank Anglaise wristwatch from Cartier is an iconic reminder that while newcomers can stake a claim, authentic tradition and excellence in the world of watchmaking are unbeatable.